In a food processor, (or mashing inside a plastic bag with a rolling pin or mug) pulse the chocolate wafers until finely ground, transfer to a mixing bowl. In a small saucepan, melt the butter, then pour it over the ground wafers. Add a pinch of salt and mix with a rubber spatula or wooden spoon. Turn the mixture into to a 9-inch glass pie or baking dish. Press with your hands or a mug, to create a crust that covers the bottom and goes up the sides of the dish. Refrigerate for 20 minutes, or pop it in the freezer for 5 minutes, to form a firm crust. Melt the chocolate in a double boiler. Set aside. In a food processor, pulse the ricotta for a few seconds until fluffed up. Add the melted chocolate and puree for about 45 seconds more, until creamy and thoroughly mixed. Using a whisk or fork, whip 1/4 cup of whipping cream in a large bowl until it thickens. Add the ricotta chocolate mixture to the whipped cream, stir it well to combine. Remove the crust from refrigerator and spread the filling inside. Place it back in the refrigerator for a couple of hours before serving. I don’t understand people that say they tried the recipe but hanged this, added that. Then they really aren’t trying your recipe. I’m so glad you enjoyed the pie, Annie! I am an excellent cook but I haVE NO IDEA WHAT HAPPENED. After getting the whipping cream thick the ricotta and melted chocolate was so thick I couldn’t even stir it. I ended up dumping it all out and will try it again. Hm. You may want to try adding double the amount of whipped cream and give it another go, Judy. I just made this No bake chocolate pie as a test run for a dinner party. I used cream cheese and substituted 2 oz. of the semi-sweet chips for bitter sweet to cut the extra sweetness. I also added a thin layer of fudge at the bottom. I had a couple of friends try it for me, and they ate the pie instead of their dinner.Thanks! Oh yum! I’m so glad you made it your own, Martha. Can the no back chocolate pie be frozen? Absolutely…just make sure it is well covered before going in the freezer. I happened to see Pati this morning on OETA, PBS from Oklahoma City, available at my house in the SE corner of Oklahoma via Pine TV Cable. I love the recipes that she showed us how to make and intend to make “Smashed Potatoes” immediately! I’m afraid that I don’t remember the ingredients for the other recipes so I would appreciate your printing everything here! Thanks so much for a GREAT program! I’m so glad you discovered the show, Mary! Here are the other recipes from that episode: https://patijinich.com/recipe/nothing-like-homemade-cookies/ https://patijinich.com/recipe/chipotle-salmon-bacon-and-avocado-sandwich/ Enjoy! Aww thank you so much Nancy! I hope your nephew has a great house warming and that his kitchen is full of love and Mexican meals. This pie was DELICIOUS!! I couldn’t find the wafers, so I used chocolate sandwich cookies instead. And those made a really yummy crust as well. I’m definitely making this again sometime. Awesome! So glad you’ll make it again, Carlos. Oh those will work great! Enjoy the pie, Christine. I was looking online and wow ricotta cheese is high calorie… And they were suggesting cottage cheese as a substitute and just whip it in the blender to get it smooth and creamy… What do you think ? because it was a lot less calories but different texture and A lot less fat! only 10% of the fat! Oh you can use low fat ricotta. Do You know the calorie count on all your dishes? And is there anyway to make this a little Lite..er calories for my husband was on a perpetual diet but loves chocolate. I appreciate it If you can recommend some substitutions, if it’s possible . thanks! I love yur show & the food is so yummy! I love the loaded baked potato and the creame and the chipotle pepper awesome sauce And then you made it even better with bacon and cheese!! Yum! Yum Yum! I’m so glad to hear you love the laded baked potato 🙂 … I don’t track the nutritional information. Pati, I put my ricotta in the blender before I added the chocolate, and it made it very creamy. If someone could not find a creamier ricotta, try the blender on high instead of a mixer or a food processor. My pie turned out fluffy and creamy. So glad you enjoyed it, Victoria. If I were to use cream cheese how much would I use? You can for sure use cream cheese…but it will be slightly sweeter. 7 oz wafer crumbs converted is? Hmm…I always go by oz to measure the cookies. What are this chocolate wafers to be used in this No Bake Chocolate Pie ? Oh you can use any kind of plain chocolate cookies/wafers you like….like chocolate graham crackers. I have not made it yet but I know it is goi!Gaing to be fantastic! Hey Patty, what kind of ricotta do you use? Oh you can use any kind you like. I recommend that you use the smoothest ricotta that your store carries. Pati, since I don’t want a food processor, can I beat the ricotta with my electric mixer??? Will the results he smiliar? Hi Pati, I baked Nana Jose’s Flourless Chocolate Pecan Cake last week and the entire family absolutely loved it! Thank you so much for sharing the recipe with us! Now I would like to make your No Bake Chocolate Pie and would really like to view the video on it before that but unfortunately, it’s not in your videos 🙁 Do you think you can include it in? Thanks for your reply, Pati. I’m a cheapskate, so I’ll wait for it on YouTube and hopefully it won’t be long 😉 Have a great weekend ahead, Pati. Hiii Pati, My uncle is a huge fan and he uses your recipes all the time! For this no bake chocolate pie can I put ranch on? Hi Patti, I am going to make this, but would like to avoid the graininess issue that some have reported having with the ricotta cheese. Could you tell me the brand name you use, or did you use a full fat ricotta versus a part skim ? Could a person use marscaponni cheese? Sorry for all the question! I don’t have a specific brand to recommend…look for the smoothest one that your store carries. Or you can substitute the ricotta for cream cheese…it will have a slightly sweeter taste. The episode with your son was adorable. I made this pie for a summer bbq and it was such a big hit! Topped it with fresh sliced strawberries. I used Goya brand chocolate cookie wafers (3.5oz pkg), and added a little extra kosher salt for a twist. SO Deelish! I will certainly make it again. So happy to hear you made it your own April! Where do you find the plain chocolate wafers? You can usually find them at your grocery store, you can use any kind of plain chocolate cookies you find like chocolate graham crackers. What kind of chocolate wafer cookies do you recommend for your “No Bake Chocolate Pie recipe? Any brand that you like is good, such as chocolate graham crackers or other plain chocolate cookie. Love anything made with ricotta, however I don’t have a food processor. Would a mixer with the whisk attachment work? Love you, your family, and your show. That is no problem Joan. You can use a hand beater, a mixer (which whisk or not), or even with a wooden spoon. I am diabetic. Made this without the crust to cut down calories and sugar. Tasted great!! Can I substitute the ricotta for cream cheese? Yes but it will be slightly sweeter. It really is easy, I made this twice . thank you for sharing! Paty puedo sustituir con chocolate blanco?? I loved the show with you and your college bound son. Also, I made the no-bake chocolate pie and it was a big hit. I will definitely make it again. Can this pie be frozen? Yes…but it should be well covered before going in the freezer. Pati, I so enjoy your show and could really relate to the one with your college bound son! Our daughter is still at home completing pre-reqs at a community college before transferring. The meal you did was perfect for quality while being quick and with few ingredients. The pie recipe is a keeper! Thank you for all the great information from your show, and it appears your son has had a wonderful foundation to back him as he makes his way in this world.Best wishes from Spokane, WA. Aww thank you so much Sally. Good luck to your daughter in college…and to you! I couldn’t find the chocolate wafers in the 3 grocery stores I visited, so I substituted them for chocolate graham crackers and it looks the same. The filling is delicious and plenty sweet. A very easy and delicious recipe. Kevin, I’m so sorry you had trouble finding the wafers…but so glad you tried and loved the pie! It is such an easy, great tasting pie to make. I will most definitely make it again. Everybody loved it. Yay! I’m super happy everyone loved it! Pati, I tried this recipe, but the end product was grainy-not creamy. I beat it again. I even added more cream. I know ricotta cheese isn’t perfectly smooth, but the texture was not pleasant. Did I do something wrong ?? Hola Peggy…I’m so sorry you didn’t like the texture. The texture depends on which ricotta you use…each brand has a different consistency. I saw the show when you were showing your son how to cook some of his favorites before he went off to college. We have three adults sons now, so I know how bittersweet are those times. 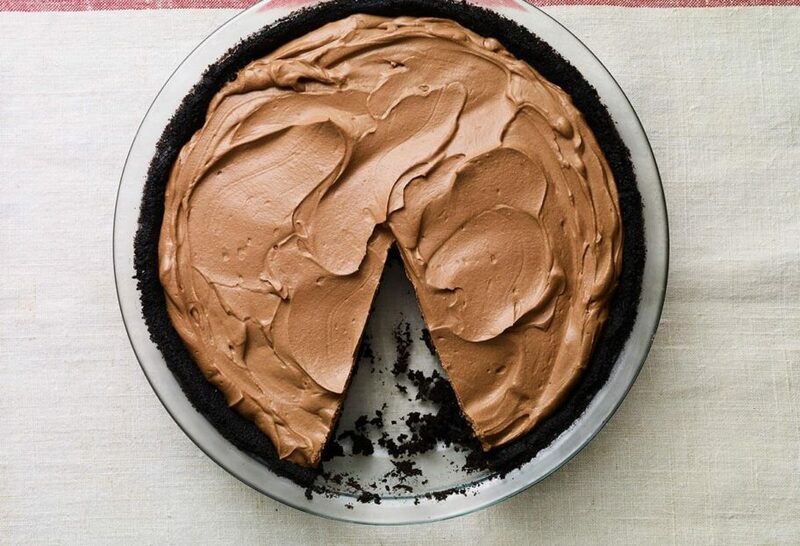 The chocolate pie looks wonderful. Wouldn’t it need a little bit of sugar for the filling? It seems like it would be a little bitter with just chocolate chips, ricotta cheese and cream. Thank you. Thank you for tuning in Gloria! How it is in the recipe works great for me, but of course you can adapt it to your taste. I tried this, followed the directions to a T, and It looked nothing like the picture. The chocolate and ricotta did not mix well at all. Ricotta is crumbly, how did you get this smooth? If it’s so easy – make it on your show – while your preparing a big yummy meal!